All serious golfers have some sort of addiction within the game. People have garages full of old putters, while others seem to always have a new driver. My addiction is wedges. I seem to have tried or owned a wedge from nearly every major brand. I originally read about Scratch Golf on golfwrx.com. They are a small company based in Chattanooga, Tennessee that do custom sets of irons and wedges. They offer “8620 Milled” wedges and “1018 Forged” wedges. These are all offered in three different sole grind options (click on link to view). If none of these please your eye, there is an option to have Scratch’s head club makers personally grind you a wedge to any shape or specification that you wish. Because of the very tight and firm turf here in St Andrews, Scotland, I chose the “Driver / Slider” sole grind for my 50* and 54* wedges. Without getting too technical, this gave me less bounce, therefore discouraging thin shots on the tight fairways. 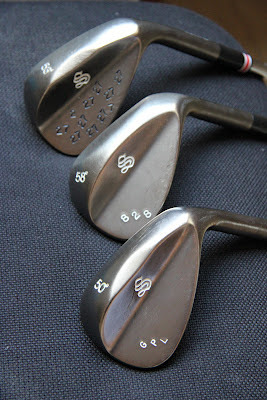 One thing you will notice is a very straight leading edge on the wedges (seen in the photo below). This is different from the rounded leading edge that is found on Vokeys and Clevelands. While this suits my eye and give me confidence on tight lies, make sure you chose a sole grind that personally suits your eye. I always look for an aesthetically pleasing finish, a nice head shape, and heavy weight in my wedges. Beyond those obvious factors, I mainly look for longevity in the clubs. How long do the grooves stay sharp? Does the finish completely come off after a few bunker shots? Although I was playing a lot at the time, my first set of Cleveland CG12’s looked years old after only a few months. My spin milled Vokeys always seemed to completely destroy cover of the Pro-V1x’s. This was before the three-month point at which they became dull and began to stop spinning completely. I have played the wedges this entire summer, which led to fairly heavy use. They have held up incredibly well. The grooves are still very sharp, and at no point did they cut up soft Titleist golf balls. The gun metal finish has held up well despite quite a bit of bunker practice. Scratch Golf allows for a HUGE amount of customization when ordering wedges. Everything can be customized including head finish, shaft type and color, grip type and color, hosel plastic color. Customers are spoiled for choice. My personalized stamping can be seen in the picture below. Without the stamping (a small additional fee), the look is refreshingly simple compared to the flash of many modern clubs. The 8620 Milled wedges cost 109 US$ with the 1018 Forgedwedges coming in at a more expensive 179 US$. The forged wedges are quite expensive, but they are an extremely good product. They are meant to compete with the likes of Miura, and they do it successfully. If you want a great simple wedge, or to be able to dictate literally every specification on the wedge, Scratch Golf is your best option. They make wedges that look incredible and perform equally well.